From the backstreets of Brooklyn, I followed the crowds of people in costume to the festival venue Avant Gardener. 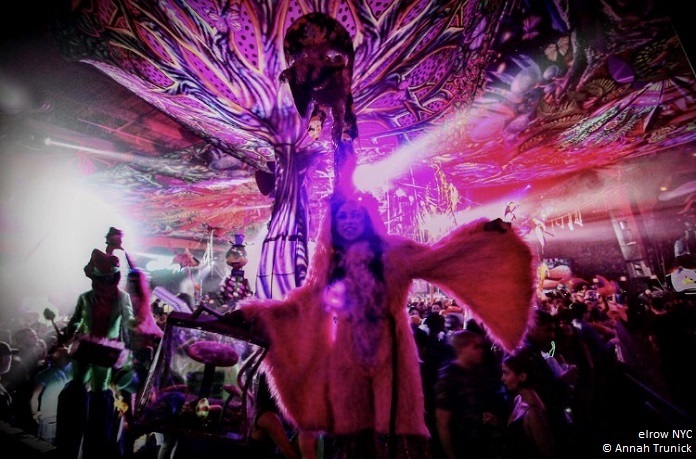 I felt like Wonderland’s Alice falling into the rabbit hole when all of the whimsical experiences, glowing mushrooms, bright colors, and fantastical characters began presenting themselves. 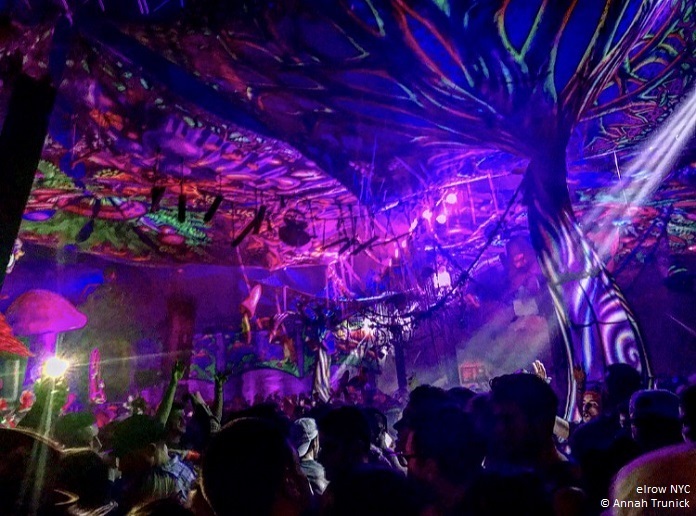 “El Bowsque Encantando” was the theme for elrow’s New York City happening on February 23rd, which translates to “Enchanted Forest.” Self-described as an experiential event, elrow’s parties are an incredibly thematic and immersive experiences. What stood out to me was that all of the crowd-goers were extremely friendly. The packed environment provided more opportunities to actually meet people and make new friends easily, which is different from most experiences I’ve had in New York City clubs. Everyone was there to have a good time. Even the bartenders and staff were dressed in wacky outfits and enjoying the night. There were so many astonishingly outrageous costumes that it was impossible to distinguish the elaborate entertainers from the attendees who went a bit extra. Jugglers, giant grasshoppers, birds, and other creatures on stilts came out to mingle and get the crowd revved up. Their costumes were both confusing and inspiring, some a little on the creepy side yet all were colorful and flamboyant. The confetti cannons went off numerous times throughout the night, adding to the raucous ambience. An additional outdoor tent area with DJs and a dance vibe different from the main area, with lots of disco balls. The style of dancing involved stomping to the beat on the wooden floor. The globe-touring party is hitting Las Vegas is this Saturday, March 23rd with the theme of “The Rowmunda Triangle” (The Party of Eternal Happiness). 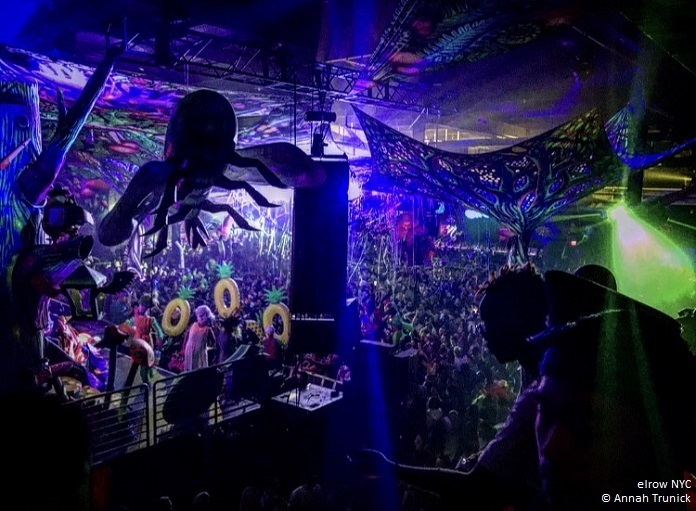 Miami will get its own Bowsque Encantado (Enchanted Forest) when elrow brings the party to town on March 30th. More information (and tickets) for upcoming elrow events can be found here. View more photos in our gallery here.